NEVADA COUNTY DEMOCRATIC CENTRAL COMMITTEE FAKE NEWS? PROPAGANDA? DISINFORMATION? VOTE IT OUT! FAKE NEWS? PROPAGANDA? DISINFORMATION? VOTE IT OUT! This writing is about trust. Trust as “a firm belief in the reliability, truth, ability, or strength of someone or something,” according to the dictionary. It follows that in order to be trustworthy, that “someone or something” has to be credible. Herein is the challenge – how do we know who or what is credible? The following is a true story from my life. It most vividly demonstrates the utmost importance of trust in relationships (and, therefore, the effects of its presence or non-presence). Here is the story: Once upon a time there was the best runner in the world. In fact, the best known athlete in the world. 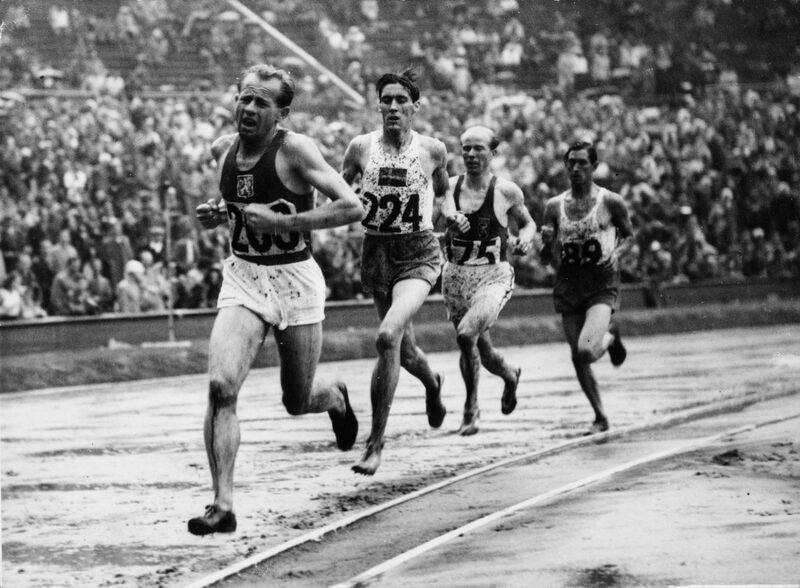 The time was the 1950s and the name of the athlete is Emil Zatopek. Look him up – google “Zatopek.” In particular, relevant to this story, https://www.independent.co.uk/sport/olympics/emil-z-topek-the-greatest-olympian-who-vanished-from-public-life-after-he-defied-russian-tanks-in-a6951031.html. Emil Zatopek, due to his actions after the Russian invasion of Czechoslovakia, his (and my) native country, was demoted from his Army position. He was forced to work as a garbage man. Of course, many people did his work for him, as a deed and a symbol of sympathy. He became a national hero. Sometime during the 1970s, I came across transcripts of a U.S. Congressional hearing with one of the “escaped” generals of the then Czechoslovak State Secret Security (StB). To my consternation, I read that Zatopek’s public persona was and is just a fraud. It all was a deception, in order to infiltrate the resistance to Russian occupation and to the Communist rule. He was described as “the worst of the worst,” spying even on his wife Dana. It was an incredible evening. The story and photos – that I took – were in the Auburn Journal; perhaps they can be recovered from some archives of that paper. I sat across the table with the famous and universally admired man thinking, “Who are you?” An honest person standing up for noble notions of freedom, or a Russian spy? I did not dare to talk to him, or ask him, about what I read and consequently thought. The only conclusions I could draw were by inference. Inference, of course, does not constitute proof. My inference is still based on trust, and therefore credibility. I knew that authorities in the then communist ruled countries were running departments and policies of “information” (really, propaganda), as well as departments and policies of “disinformation” (really, in today’s jargon, fake news). This stands in contrast to the documented public behavior of Emil Zatopek and my personal impression from my meeting with him. You can make your own inference about which side is more trustworthy. The story has relevance to today’s situation. Whom can we trust? The political chameleons speaking from both sides of their mouth, uttering totally contradictory statements? Is it not our duty to demand consistently trustworthy speech and actions, from any elected official, in any position, from local to national? Are our systems and processes trustworthy? In many respects, my current experience can be expressed as “back to the future.” During my youth I lived in an environment where nobody could trust anyone. Misplaced trust can have catastrophic consequences – the German people of the past century trusted their “Leader” Hitler right down to the wartime destruction of their country. We have to be careful. It appears, and for good reason, that there is a general lack of confidence in the elected representatives or officials to govern. This is a lack of trust. Trust is an essential attribute of organizational and societal success. It is therefore imperative that we shall restore it, via means of the upcoming elections. There are three rules for assuring success. Number one – show up! For elections, it means “vote.” Number two – do the right thing! This means, “vote for the right trustworthy candidates.” Number three – it actually articulates the consequence – all of us will have to live with the results. Let us end the era of fake news, propaganda, and disinformation. Show up and vote for the right candidates! I trust we will do just that. Thank you for describing your experiences and your appeal to restore trust. Our President is now doing everything possible to destroy trust, both within and outside our country. We are told by him that our law enforcement and our intelligence services are corrupt , and our allies are informed by our behavior that they cannot trust us and must “go it alone”. But we are stronger together, when we are able to depend on others. This Presidential behavior is not innocent; it is intended to cause chaos and, if left unchecked, can only result in weakening and possibly the destruction of our democracy and fracturing of those institutions built on war and disastrous experience .